Get in touch with us, if looking for Ceiling T Grids. 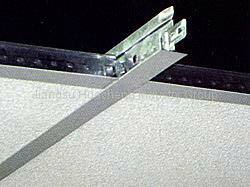 Located in China, we are a preeminent Manufacturer, Exporter and Supplier of Ceiling T Grid. Our Ceiling T Grids are acclaimed for their excellent finish, corrosion resistance, uniform color and perfect locking systems. Hence, they are widely used in the construction industry. Talk of price; we are known for providing the best quality at reasonable prices.